The fabulous Thorgy Thor, famed worldwide from the hit show RuPaul’s Drag Race, is in town this weekend for a thrilling, thoughtful, and hilariously theatrical show – the first of its kind in Canada! 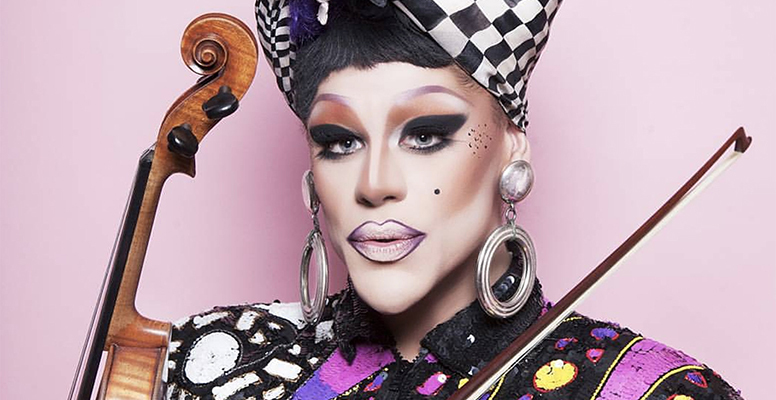 The Coast’s Brandon Young interviewed Thorgy ahead of the concerts, and the reigning “queen of classical music” has definitely left us feeling incredible! 1. Can you give a brief history of your time in the world of drag? Brief is impossible! I could go on and on about the situations I’ve been in, running around New York City dressed like a clown queen at 5 am on the subway! I started out experimenting with performance art ideas – painting my whole body red and moving in slow motion for five hours in public, just as an idea. Then, I moved into doing theatre roles in original plays, and then Psycho Beach Party as Marvel Ann. I was always a classical musician, so I lived two completely different lives day to night, and I loved every second of it. When I moved into Brooklyn, the scene was filled with only a few working queens that I could count on one hand. I was one of them. So, I lived in a basement club scene experimenting with ideas for years. I was brought into large Manhattan clubs and worked for almost every club/promoter/party in NYC for years. I auditioned every year for RuPaul’s Drag Race because I thought to myself, “This is where drag is going – mainstream TV – and it’s about time.” It took my eight years auditioning to get on, but I think I made an impression. I’ve been invited to perform in four continents and many countries across the world. Not bad for a man in a wig who plays violin! 2. How would you describe your personal drag aesthetic? I am a fashion clown. I love pairing designer clothing with cheap bangles or a custom sequin jacket with a dollar store wig. My closet is VAST. I could fill a museum and tell you where I bought each piece, how much I paid, why it’s important, and who I bought it from. I really love clothes. I also love having fun and infecting people around me with the energy. It’s who Thorgy is. I’m a bit kooky and distracted by shiny things, but also an intellectual and ready to try anything new! If you haven’t guessed I’m a Gemini. 3. You studied music in university, but was classical music always a part of your performance. If not, when did you decide to include it? Classical music was always a part of my drag performance. If you look back at some of my earlier drag performances, they were 12 minute “numbers” with my voiceover telling a story, while the background music was Schubert string quartet featuring me, me, me, and me on every instrument that I recorded in my apartment. I still love to lipsync to a Gilda Radner number and make everyone laugh, but to be able to introduce a young audience to classical music in an artistic draggy way is what I love to do. It just has always seemed natural to me. 4. Your performance with Symphony Nova Scotia is coming up – how did the opportunity arise? Both seasons on Drag Race, I was featured playing violin. In season 8, RuPaul asked me to stand up and play violin at the finale, and I got a standing ovation. And All Stars 3, I played violin during the ‘talent’ episode. I mentioned on the seasons that I would like to create my own THORCHESTRA and travel the world. I have so many friends that I met in conservatory that have said to me: “When you start your orchestra, make sure I have a seat.” But, with touring so much doing other projects, it has taken a lot longer than I expected to put together your own orchestra. So, I was elated when Daniel Bartholomew-Poyser (conductor of Symphony Nova Scotia) reached out and said, “Would you like to do Thorgy and the Thorchestra with our symphony?” Yes ma’am! 5. What can audiences expect from your performance? Well, I’m always a believer that each show changes and evolves and gets better as you do them more and more. This is my first ever experience doing this. Come to think of it, it’s the first Drag Queen I’ve heard of playing live with a national symphony. So, I’m making history, I guess you could say! Werk! Daniel and I met and threw out ideas, and over time, we put together a bunch of ‘ideas’ for the stage that are literally just that. Live violin and cello from me, a full symphony orchestra filled with professional players, and a few other kooky ideas that I needed to try on stage to stick true to Thorgy. Some of them might be a disaster! But, who cares! We’ll cut them out of the next show! The audience is going to laugh, cry, and hopefully not walk out half way through and demand a refund. 6. Do you typically perform with orchestras, or is it venue dependent? Good question. I grew up performing in basement clubs in New York, which are tiny. However, after this magnificent show is a success, I’d like to bring the Thorchestra down to a small number of players that will fit. And find a music venue like Le Poisson Rouge or Joe’s Pub to continue this show in New York. Then, next step – tour the world playing with every major philharmonic and symphony orchestra across the globe. Why not shoot for the moon? 7. Will your performance include any original compositions/any notable composers? I don’t want to give anything away just yet. But, our set list is eclectic, to say the least, with compositions spanning over hundreds of years. 8. Did you have any idea that your Nova Scotian fan-base would be so large – how do you feel about the fact that a second show was added to accommodate your Atlantic Canadian fans? I was ecstatic! As a Drag Race queen, you always hope to find that niche and run with it. For instance, Bianca Del Rio is selling out her comedy specials, and Trixie Mattel is selling out her comedy/country music tour. It’s tough not to compare yourself to other talented acts in the same field. They are both winners of [RuPaul’s Drag Race], and I didn’t even come close (I was robbed! ha ha), but it sure is an ego booster when I heard we SOLD OUT the first show and needed to add another date. I mean… WERK! I’ll say it again, next stop: international tour. I am so humbled and have even cried while practicing for this; it really means so much to me to combine my two selves and have so much interest from the public. THANK YOU. 9. Drag is obviously touching many facets of day-to-day culture, and opening doors for many queer artists. You’re taking it to the world of classical music – what is your mission/the message behind your performance art in terms of drag plus classical music (which isn’t typically known as a queer art form)? This question answers itself! That is my mission exactly, to combine classical music lovers and drag lovers into one room. Two worlds that could not be further apart, but have been one world for me my whole life. I’m going to ask the audience, “Who is here for classical music? Who is here for drag ridiculousness?” and then have everyone turn to their neighbour and shake hands. It feels good to bring everyone together under one roof. I’m hoping that the younger generation of kids that are artistically inclined and queer identifying look at me and feel inspired and say to themselves, “I, too, can be a man in a wig playing violin on stage.” HA! 10. Your performance is happening during Halifax Pride Week. Will you have time to partake in any festivities? I return from a four-city tour in Australia the day before, so I’m hoping I don’t pass out during the show due to the time change! I have dress rehearsals and preparation every second I’m there, so unfortunately it doesn’t leave me with much time to run around the city causing trouble! 11. What do you hope audiences will take away from your performance? For more information on Thorgy and the Thorchestra, click here. For the Coast article, click here.